Cleveland sports fans are used to losses, but this year, the headlines are more depressing than ever. The Cleveland Plain Dealer has recently proclaimed, "Cleveland Browns are in a regression, leading to severe fan depression," and "Rock bottom? The Cleveland Browns should be so lucky with four games remaining." Even Browns fans, it seems, are tired of the Browns. But long, long ago, before our dear, terrible team had solidified themselves as being even more terrible than usual, I emailed a bunch of Mike's friends (I think I'm allowed to call them my friends now?) to ask if anyone would be interested in going to the Browns v. Ravens game the Monday after Thanksgiving. A Monday night game! The Browns versus the old Browns! Friends & tailgating! And so six of us signed on to attend, paying $47 apiece for tickets that, the day of the game, were selling for about $12. Hindsight is painful. I hadn't been to a Browns game since I was a little kid - back when my dad was still alive, I think, but maybe that was an Indians game & I'd never actually seen the Browns play? Beats me. What I'm saying is that I was pretty excited, despite the Browns utter lack of respectability. We met up beforehand at a hole-in-the-wall, cash-only bar that serves Genessee & claims to have the best corned beef sandwiches in town. Everyone but me was decked out in Browns gear; our friend Erin knitted her own scarf bearing the name of every Browns starting quarterback. 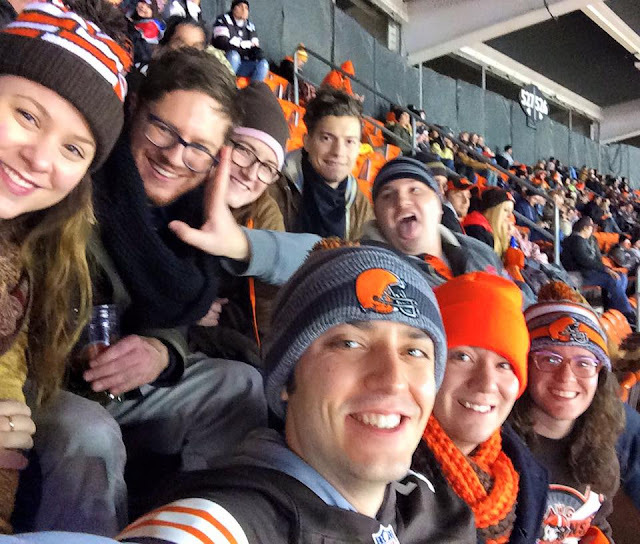 We forgot to eat dinner & got a little tipsy, following the pack of rabid Browns fan on the walk across the bridge & into the stadium, where I immediately consumed a hot dog & purchased a Browns hat for a whopping $28 because I wanted to show my Cleveland pride. This game was a disappointment of epic proportions, even for the Browns, who lost in the last few seconds. But because Cleveland is accustomed to loss, nobody even seemed to yell or moan in horror when it happened - we all just sort of, like, nodded & meandered away, sad & defeated. And then "Float On" by Modest Mouse rang out through the stadium, song about being so close but still falling short. In all, the game was depressing as hell - & I still had a great time. Would it be preferable to have a team who isn't a perpetual disappointment? Yeah, for sure. But Cleveland's got grit, & Cleveland's got the Browns, & win or lose, I was honored to wear the brown & orange & watch my first in-person Cleveland loss. It felt like a rite of passage. And we'll all float on, OK? We'll all float on anyway.